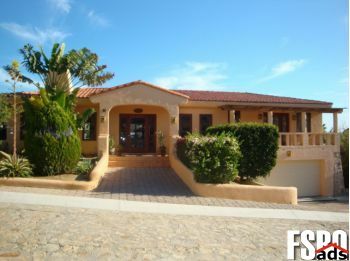 Charming Hacienda style home located on the prestigious sea side community at only 5 miles of Cabo San Lucas activities and within 2 miles of super markets, banks, restaurants, gym, golf courses and spa services. One the safest ways to wisely invest your money. This cozy home is conveniently built in one level with easy access to every room in the house including the BBQ/Pool area. Spacious rooms all over the house, high wood ceiling, bright and wide open lay out and intimate ambiance at the living room around the chimney are some features you can enjoy at this quite up-scale residence. Ocean front club house with Pool and BBQ. Check this out and compare... This is one of a kind opportunities to have your million dollar home for much less than that.